There’s an old Chinese curse that runs, “May you live in interesting times.” And sixteenth-century Japan was certainly an interesting time from a dramatic point of view—which is undoubtedly why Akira Kurosawa chose it as Seven Samurai’s setting. But those who lived in that period may well have considered themselves peculiarly accursed, especially if they were unlucky enough to be farmers. “Land tax, forced labor, war, drought . . . The gods want us farmers dead!” lament the villagers in Kurosawa’s film. From the late twelfth century onward, Japan was ruled by a shogunate—the shogun being the commander of the Imperial Army—with the emperor reduced to a puppet figure, lacking all power or influence. (One emperor became so impoverished that he could survive only by selling samples of his calligraphy.) From time to time, the ruling shogunate clan would be overthrown by another. The Ashikaga shogunate gained power in 1338, but over the next two hundred years, its control steadily dwindled. By the early sixteenth century, the country was racked by incessant civil war, as rival daimyo (local warlords) struggled for supremacy. Each warlord had his own personal army, drawn from the samurai caste. A samurai, as a feudal retainer, owed personal loyalty to his lord, and if his lord was killed or defeated (which, given the constant battles, happened quite often), the samurai was out of a job. If he couldn’t find employment with another lord, he became a ronin, or masterless samurai. The ronin is a frequent figure in jidai-geki (period) movies, a loner with something of the dangerous, romantic aura of a solitary gunfighter in a western. All the samurai hired by the villagers in Seven Samurai are ronin. Despite the breakdown in civil order, the rigid caste divisions that governed Japanese society largely held firm. A man born into the samurai, peasant, artisan, or merchant class was ordained to stay in it (though it was rare, women could marry into another caste), and caste conventions dictated what he could wear, what weapons he could carry, what kind of house he could live in. Since a samurai’s code forbade him from earning his keep through menial labor, many ronin became bandits, turning their fighting skills to outlaw ends. To the farmers whose crops were pillaged, houses burned, womenfolk raped or abducted, the distinction between samurai warriors and bandit troupes became all but meaningless. Hence the fear and mistrust in Seven Samurai between the villagers and the warriors they’ve hired to protect them, most vividly expressed in the passionate outburst by Kikuchiyo. A farmer’s son who wants to become a samurai, he can see both sides: yes, he rages, the farmers are cowardly, mean, treacherous, quite capable of robbing and killing a wounded samurai—but it’s the samurai, with their looting and brutality, who have made the farmers that way. And the shamefaced reaction of his comrades makes it clear that they can’t dispute the charge. Kurosawa, himself descended from a samurai clan, makes no bones about this dark side of the samurai tradition. And there’s an implicit side-glance at more recent history, the period preceding and during the Second World War, when Japan’s militaristic government perpetrated a still crueler distortion of the samurai code of Bushido (the way of the warrior). But as a counterbalance, Kurosawa offers the selfless and altruistic figure of Kambei, the leader of the seven, who personifies the Bushido code at its purest and most Zen-based. We’re given the measure of Kambei in his very first scene, when he has his head shaved to impersonate a priest, in order to rescue a kidnapped child. The amazement and horror of the onlookers convey the enormity of what he’s doing: he’s cutting off his own topknot, a key signifier of his samurai status. (In Masaki Kobayashi’s Harakiri, from 1962, the hero defeats a whole band of samurai sent against him and, rather than kill them, merely cuts off their topknots. The disgrace of this loss, he knows, will drive them to kill themselves.) But to Kambei, such an outward display is unimportant compared with his duty as a samurai to help the helpless. With Seven Samurai, Kurosawa also set out to debunk some of the more inflated myths that had attached themselves to the samurai. In jidai-geki films—especially those made under the military government—samurai had become kamikaze warriors, motivated solely by honor and blind loyalty, fighting doggedly to the death rather than admit defeat. 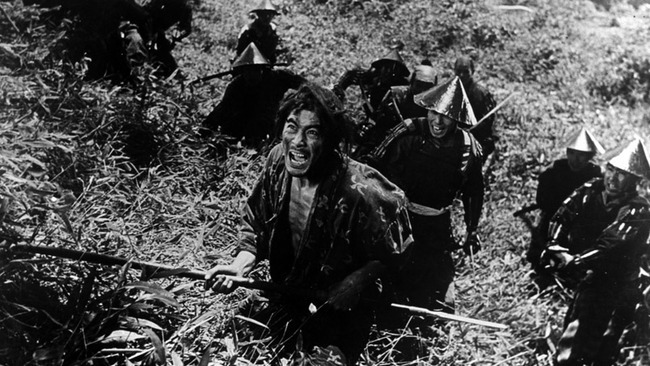 Kurosawa undermines such false heroics in the exchange between Kambei and his old friend Shichiroji, who last he heard was on the losing side in a great battle. When Kambei asks him how he escaped, his friend replies, “I hid among the grasses in the moat until dark,” and the two men laugh. Later, Shichiroji asks another of the samurai, Heihachi, how he deals with his opponents. “There’s no cutting me off when I start cutting, so I make it a point to run away first,” responds Heihachi. “A most excellent approach,” says Shichiroji approvingly. At the end of the strife-torn sixteenth century, soon after the period of Seven Samurai, the Tokugawa clan gained power and reestablished shogunate rule over the whole of Japan—a rule that endured for the next two hundred and fifty years. Foreigners were expelled; Japan became a closed country, cut off from the outside world. In many ways, it was an intolerant, rigid society, with little room for dissent. But trade and the arts flourished—and given the turbulence and slaughter of the preceding period, it’s understandable that most Japanese would have preferred the “great peace” of the Tokugawa shogunate. Philip Kemp is a film critic and historian, and a regular contributor to Sight & Sound, Total Film, DVD Review, Times Higher Education, and Inter­national Film Guide. He teaches film journalism at the University of Leicester. This piece was originally published in the Criterion Collection’s 2006 edition of Seven Samurai.